Since taking Dave Ramsey's Financial Peace University I've been convicted of the fact that I need to have a life insurance policy. During the class they share the story of one young father who after taking FPU bought a term life insurance policy. A few weeks later he was found to have terminal brain cancer. His family was lucky because he bought insurance before receiving the diagnosis, and they were now taken care of and would be able to stay in their home after he passed. God forbid that I should ever die while still young and my wife be forced to try and move ahead without me, but now that we're expecting our first child, there is even more at stake. I know I now have even more to protect. It's time to start shopping around for life insurance quotes. 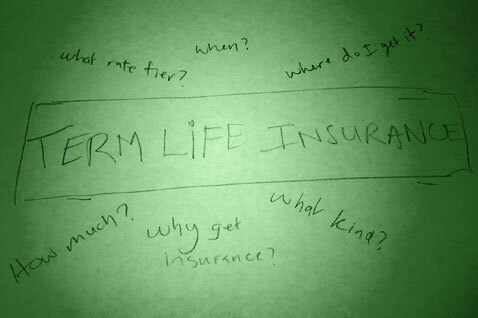 Should I Get Term Life, Whole Life, Universal Life Or VariableLife Insurance Policy? There is a debate surrounding the topic of when people should get life insurance. Some people say it isn't a huge necessity to get life insurance until you head down the road of having children. Others say that you should buy term life insurance when you're younger – even if you don't have children – because you'll be in better health, the rates will be lower, and who knows if and when you'll have a health issue that will preclude you from obtaining affordable life insurance. I used to come down in the camp that felt you didn't need life insurance until you have children. My reasoning was that my wife has a job, and she would be able to continue paying for her living expenses if I died, and since we have no children she wouldn't need to pay for child care, or anything associated with having children. After hearing stories, however, of young healthy people who all of a sudden have major health crises and all of a sudden can't qualify for life insurance – even if they wanted to – it got me thinking. I realized that we're planning on having children someday – and you never know what will happen. Term life insurance is so cheap that there really isn't a good reason not to get it now – even without children. Now that we're expecting our first child, however, I knew it was time to move ahead. Another debate you'll often hear when it comes to life insurance is whether term life or whole life insurance is the better deal. With term life you just pay your premiums, and if you die your family gets paid. Simple as that. Whole life and other cash value type policies have an investment or savings component to them as well – often meaning that you'll get your premiums back at the end, some investment gains or that you'll get an annuity. I believe that in most cases term life insurance is the better deal. The reason? You can buy term life insurance much cheaper. That means that you can take the difference between what you paid for term life and whole life, and invest it – without added layers of fees from the insurance company. Of course, that is assuming that you're disciplined enough to actually take the difference and invest it. Your returns by investing on your own will almost always be better. One of the keys to finding a good term life insurance policy is to shop around and get quotes from a variety of different places. That way you can make sure you're getting the best possible policy for the best possible price. Check with your employer: Often you can get group discounted rates through your employer. They may even already offer you a small policy for free. Check with your HR department. Zander Insurance: This is the insurance aggregator recommended by Dave Ramsey. I actually found some of the best rates here as well. Those are just a few of the aggregators that I found. You can also go directly through an insurance agent, or the company itself to get a quote as well. After you've gotten your quotes, and have decided on a particular company, you're most likely going to have to undergo a medical exam before the policy is issued. The results of that examination will determine not only if you're insurable – but also what rate category you'll fit into. This is one of the things I'm worried about because I'm currently a bit overweight. I don't want to wait however, to get into better shape to get a policy. Live and learn. Wow, that's a lot of stuff to remember. I'll have to remember all that when I get to the exam! After you've decided on a policy and passed your medical exam with flying colors, you'll need to decide how much insurance you want to buy. So how do you determine how much insurance you need? As a general rule of thumb, you should have 8–10 times your income in guaranteed renewable term life insurance. Life insurance is designed to replace you, financially speaking, if something happens to you. Let's say that you earn $50,000/year, and you have $500,000 in term life. If you pass away, your spouse should take the money and invest it in a solid mutual fund. If your spouse simply pulled 10% interest out each year, he or she would receive $50,000, without ever touching the principle. Your income would be replaced. Others suggest that you should have even more, close to 17-20 times your annual salary. I'm on the more conservative side of things, and want to make sure my wife is taken care of, so I'll probably be in the 10-15 times my annual salary range. Once you purchased your policy you'll have the option of paying for it in monthly, quarterly or yearly. The prices will vary depending on which way you pay – with the yearly option saving you the most money. The only thing I've heard against paying yearly or quarterly – is that you shouldn't pay for insurance up front in case something does happen during the year. That way you're not paying more premiums than you need to. It really comes down to which you prefer. Paying a little less by paying yearly, or paying a little more and insuring against paying too much in case of your death. Either way, you want to make sure that your life insurance policy never lapses, so you want to make sure that you set up the payment to be sent automatically. Nothing could be worse than having someone die, and finding out the policy has lapsed because the premiums haven't been paid. I'm not quite done with the process of finding term life insurance, but I soon will be entering the final phase. I plan on purchasing 20 year term policy with a value of 12-13 times my annual salary. How much I get will also depend on how my examination goes, and the resulting rate changes. We shall see – I'll post another update once I've found and purchased my policy. Do you have a life insurance policy? What kind? How much insurance are you carrying? If you don't have insurance, why not? Do you plan on getting insurance in the future? Tell us your thoughts in the comments! That’s exactly what we did. We both bought term life policies even prior to having children. And for the coverage it is super cheap. Make your wife the owner of the policy, otherwise the proceeds could be included in your taxable estate and you really didn’t want Uncle Sam to be one of your beneficiaries, did you? Make certain you get a convertible term policy. Should YOU discover brain cancer before the term runs out, you probably won’t be able to get insurance when it does run out. Ramsey assumes everyone will be debt free and semi-rich before the term runs out but less than 2 percent of all term policies ever pay out. Why? People don’t die during the term. Think on that one for a while. Not all whole live or variable policies are bad, but too many gurus assume they are simply on the basis of cost. My whole life policies on my kids are paid up. I never have to pay another dime yet the benefit continues to increase. Good points to consider. I do hope to be self insured by the time the term runs out, but i suppose one never knows. If you buy 20-year term at 12X your current salary, it will probably be 4X your salary by the time you hit year 20. You’ll need to have the rest in savings. Some insurers (USAA for one) have ART polices that increase slightly each year. Not sure if they have a term20 that does the same thing. If you work with an agent they can probably structure something that increases over time. I also never really understood the 8 to 10 times your income, rather than 8 to 10 times your expenses? But that might lead people to be under insured since most people (not you lol) have no clue what they spend a year. Just to add a bit to Ron’s comment above. If you do transfer ownership of your policy, do it as soon as is feasible. Because if you transfer the policy within 3 years of your death, the full amount of the proceeds will still be included in your estate. Good information, most of which I agree with. I think the vast majority of folks are better off buying a term policy, especially in the early years of adult life. The vast majority of my business is term insurance, but I do have to say that recently it seems I have been trying to help a lot of older folks who are in the position of having their term policies end (well, the level period is ending, putting the premiums out of reach) yet still needing insurance. Permanent policies have their place, they just need to be used properly as part of an overall financial plan. Dave Ramsey claims that all permanent insurance is “junk layered with fees”, but he is just flat out wrong. All life insurance costs the same amount–term or permanent–and all types of life insurance have fees. It saddens me to see that people following the “buy term” part of his advice often end up failing to “invest the difference”, leading them to my office where, often times, I can’t help them do to health or other related issues. Anyway, not to stir the big “Permanent insurance vs. Buy Term Invest the Difference” debate, but there is more to consider than meets the eye. I have always heard that 5x your annual salary is a good amount to have. Thanks @LeanLifeCoach. I was about to mention when you get quotes, it may be important to consider how each of these different places work. Some try to sell you insurance and actually offer fewer companies to choose from than many life agents. Some just sell your contact information to a bunch of different agents who will call/email you. And there is one that let’s agents compete for you anonymously and lets you control who contacts you after you see what they have to offer. Again, the way you get quotes may not be that important to you. But for those who want to get competitive quotes without any hassle, it probably is. 1. I’d have to politely disagree with the comment to purchase renewable term. Unless you have a condition that may prevent your insurability down the road, the extra premium you’ll pay now won’t be worth it. And as you said, Peter, the goal is to be self-insured by that point. 2. We recommend our clients taking out life insurance coverages that covers three needs: the present value of all current debt, the present value for the monet needed to replace the lost income for X amount of years (largely dependent on child ages), and the present value needed to replace retirement savings that can now no longer be saved (not as applicable to younger families). I believe this formula, although trickier to calculate, is the best way of figuring out true life insurance needs. I purchased my first life insurance policy at 23 years old. It was a convertible term policy. This way I was able to lock the low premium rate. I converted to a whole life insurance policy a couple of years later. I got as much insurance as the company would give me, not 10 times my salary or 15 times…as much as I could get. I want to leave the most I can to the people I leave behind. We all buy car insurance to insure our cars, homeowners insurance to insure our homes. These are just things. I believe in insuring our lives because we have so much value. We leave our legacies to our families, to our churches, to charitable organizations like the Susan G. Komen fund, or to research to help find cures for autism or Parkinson’s disease, anything you like. I disagree with buying term and investing the difference. One big reason is because most of us will not invest the difference. Second, I find it’s better to invest in a vehicle you control like whole life, than a 401K or an IRA, because it is not subject to market trends. The cash value only goes up. There are many advantages of whole life insurance like protecting your life value, it grows in a safe, accessible vehicle, and you have all the control. In my experience of investing in real estate, penny stocks, the 401k, Teacher Retirement, the IRA, my whole life insurance policy is the best thing I have ever invested in…hands down. Yup – TERM life. My husband and I both have it. Don’t forget to have your wife get some as well (especially if she cares for the children). If she ends up passing away the insurance can cover childcare costs and enable you to continue working. I’d get term life for my wife as well, however, she has some serious health issues that preclude affordable life insurance. Peter, does your wife qualify for a “Group” life insurance policy? If your wife is a licensed Realtor for example, she might be afforded the option of a guaranteed group policy. I’m not sure if those policies are being offered anymore but I’ve heard about them. You could check in with your local Realtor board to find out I suppose. In any case, we couldn’t agree more about how affordable term life insurance policies are and wanted to compliment you on your tips for the medical exam. My wife is a stay at home mom nowadays, so no group policies are available for her.